These answers only pertain to Tableaux® Faux Iron, the premier brand of faux decorative grilles that Pioneer Window Fashion carries. 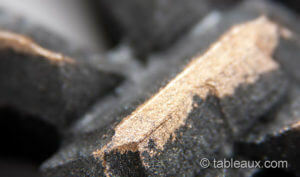 The short answer is wood fibers and resin. 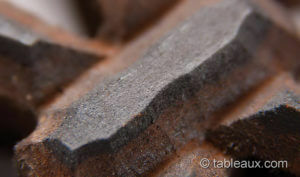 The more formal answer is: Tableaux® Faux Iron Designer Grilles are environmentally friendly, made from recycled wood fiber with no additional formaldehyde. They are painted with water-based paints finished with a sheer wax UV coating. What color finishes are available? Can it be mounted outside in any climate? Yes, but be sure to order the exterior product. 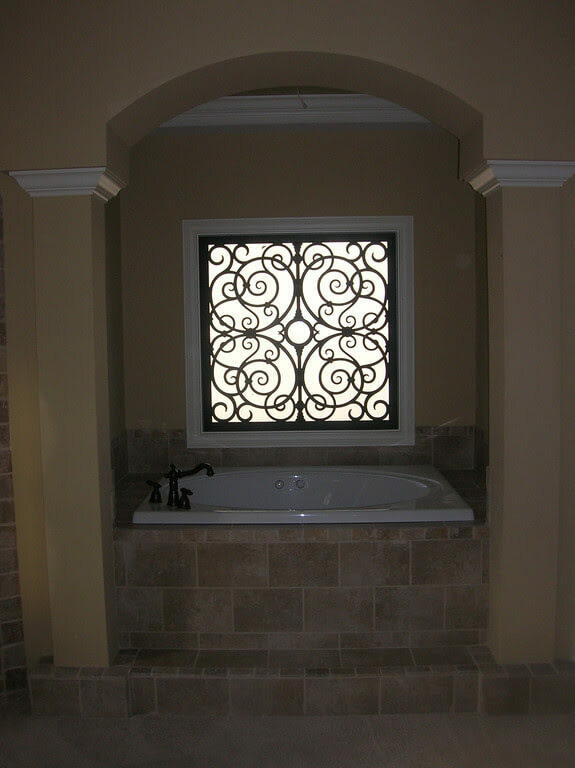 The exterior grilles are moisture resistant, rot resistant, and termite resistant. Bring on the snow, freezing rain, thunderstorms, and the dreaded HHH (hot, hazy, and humid) weather. 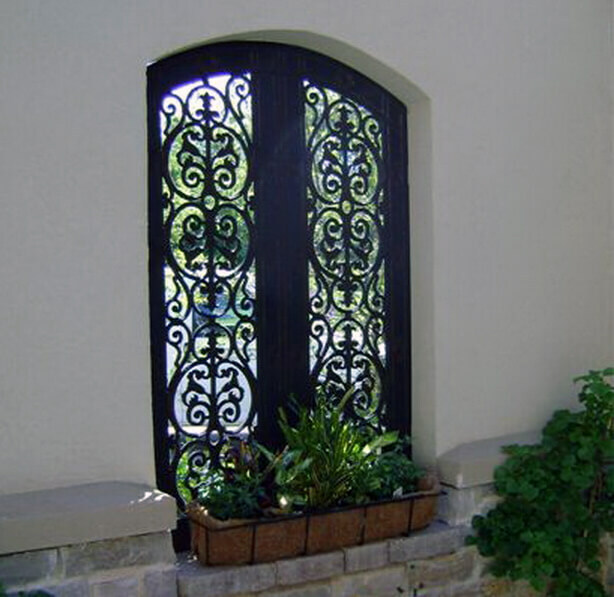 Exterior Tableaux® Grilles have a five-year warranty and are the same price as interior grilles. If I want to change the look , can it be painted? There may be risks with removing the wax. 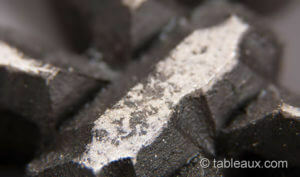 We cannot guarantee that the product you use to prepare the surface will not harm the grill. Does Tableaux make wooden grills? 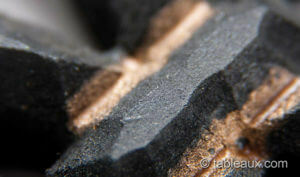 Yes Tableaux also makes wood type grills from wood fiber and resin with a black walnut veneer coating. 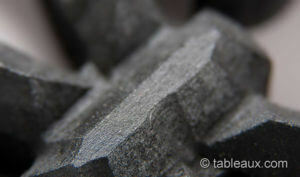 You can see them here, under Tableaux Veneers. These grilles are for interior use only. 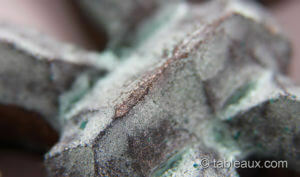 Can I use glue or epoxy to attach Tableaux® Faux Iron to a window? 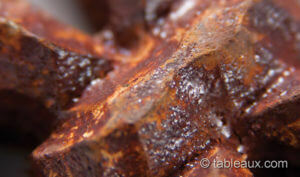 Glue is a very generic term and there may be components that degrade the resin in the grill. We also do a lot of work with glass at our sister company, Pioneer Glass, and sadly, glass can and does break. We strongly recommend being able to remove your grilles without damaging them. Almost every house in America now has insulated glass windows. Eventually all those windows will have seal failure and will become “foggy”. The glass units will need be replaced. Epoxy is sensationally strong and it is unlikely that you will be able to remove the grill without damaging it. Here is an information sheet on Tableaux® recommended hanging options. Do you do installations into double pane windows? Yes, you can install them between the panes in double pane windows. We also work at our sister glass company and do a lot of work with restoration (antique) glass, specialty mirror, custom cabinet glass, and insulated double and triple pane window replacement glass. Is it strong enough to put on an open cupboard without a frame and used as a door? Tableaux® Faux Iron and Veneers have hinge- and magnet-installation hardware available that can allow swing out grills to clean the rear glass in windows and cabinets. For cabinets that will be opened frequently, cabinet door frames should be installed and the grilles should be mounted on the doors. 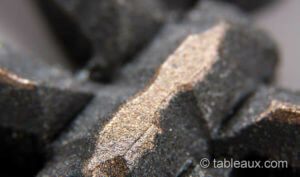 Are Tableaux® Faux Iron and Veneers made in the United States? Tableaux products are proudly made in the United States by American craftsmen using lumber products from the northwest USA.